Treasure Life » Treasure Bead Holiday Collection is Back! Are you documenting a health journey through our Treasure Bead program? Then get in on our holiday promotion. 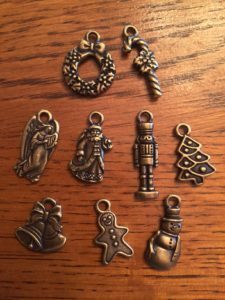 Right now you can receive one of our beautifully crafted Christmas theme specialty beads: wreath, candy cane, angel, St. Nick, toy soldier, Christmas tree, bells, gingerbread man, and snowman (snowflake missed the class picture but is also available). Stop by any of our Treasure Bead locations if you have a hospital appointment in Edmonton to collect a bead. From out of town? Order online. Simply check off the Seasonal box on the Treasure Bead Order Form and you will receive one bead selected at random. Why only one? Well, quantities are limited and we would like to share these beads with as many families as possible. Don’t worry. Already decided you have a favourite? Let us know on the bottom of your order form and we’ll do our best to accommodate your request. Capture the magic of the season and make one of these beads a stunning addition to your child’s journey chain.